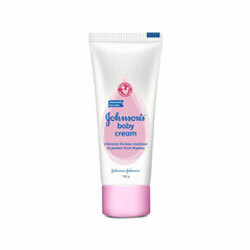 Johnson's Baby Cream nourishes baby skin, protects baby skin from chafing, rubbing, cold. Moisturizes baby's skin. ohnson's Baby Cream contains Lanolin which nourishes baby's tender, delicate skin and protects it from chafing, rubbing, cold etc. The cream contains Vitamin A & Glycerin which moisturizes the baby's skin and is great for mothers too. It is good for chapped cheeks, 'crawler's knee', tender noses and rubbed elbows. Helps to protect against irritating wetness and windburn. Contains emollients that help moisturise your baby's skin and preserve it's natural softness. Apply after bath to delicate areas of the body and repeat application as often as needed. For external use. Keep out of reach of children. Discontinue use if skin irritation occurs.